Why have we built this site? Our goal is to serve students and others who are considering biotech careers by providing information about the careers in the biotech industry that do not require advanced degrees. We began this site because we noticed that many science career sites take the opposite approach. They focus on the small percent of industrial science jobs that require a Ph.D. Not only is this practice misleading, it may be harmful. We suspect that the practice of limiting job descriptions to those requiring advanced degrees makes science careers seem out of reach and may keep many students from considering science careers. We're here to correct the impression that science jobs require a Ph.D. Like many other industries, a large fraction of the jobs in biotech are held by people with Bachelors and Associates degrees. A frequent combination is a Bachelors degree from a four-year college with a community college degree or certificate in Biotechnology. We are Biotech Careers. Biotech Careers originated out of Bio-Link, a national center of excellence that is funded in part by the National Science Foundation's Advanced Technology Education program. Bio-Link members operate biotechnology education programs at primarily two-year colleges throughout the United States. Many of our leadership team members have been involved in biotech education for over twenty years. How can you do this? Read on. The home page has a section called "Learn the Lingo". 1. Click within the Learn the Lingo section to go to the quiz page. 2. The quiz page has flash cards that will help you learn some of the most common biotech abbreviations. Be sure to study these before your first interview! Select the careers link to see a list of careers then select a career to investigate. Each career page has a description of the job, salary information, education requirements and links to colleges that offer related certificates and pre-set job searches. 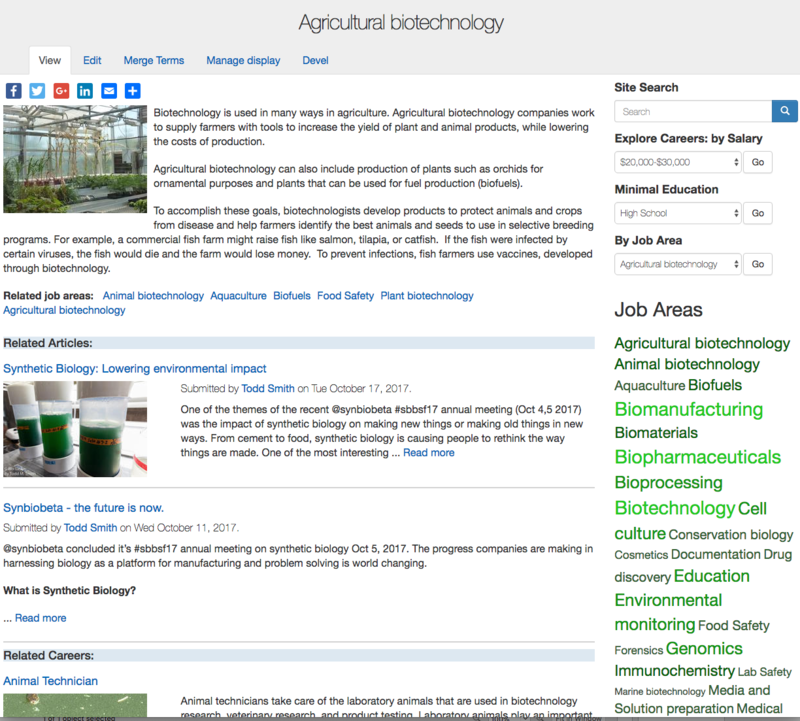 There are many interesting job areas in biotech and many careers can fit into a job area. 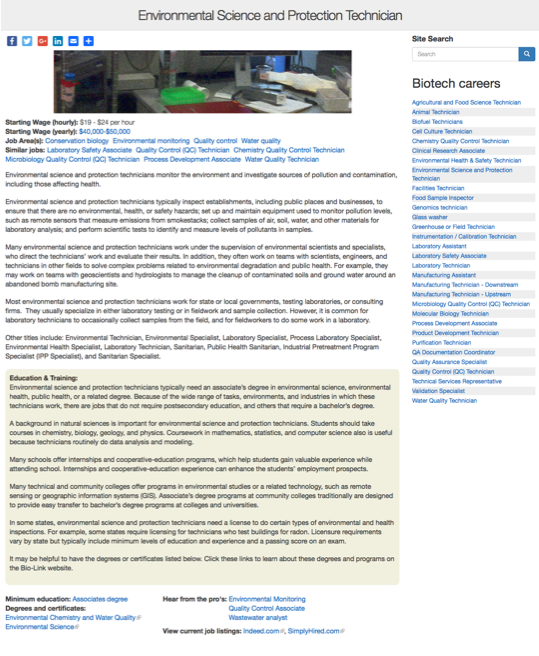 In Biotech-Careers.org there are two ways to learn about job areas. The first is to click the Job Area link at the top of each page. From the list that is returned, choose one of the job areas to see a description and find videos and photo diaries related to that area. 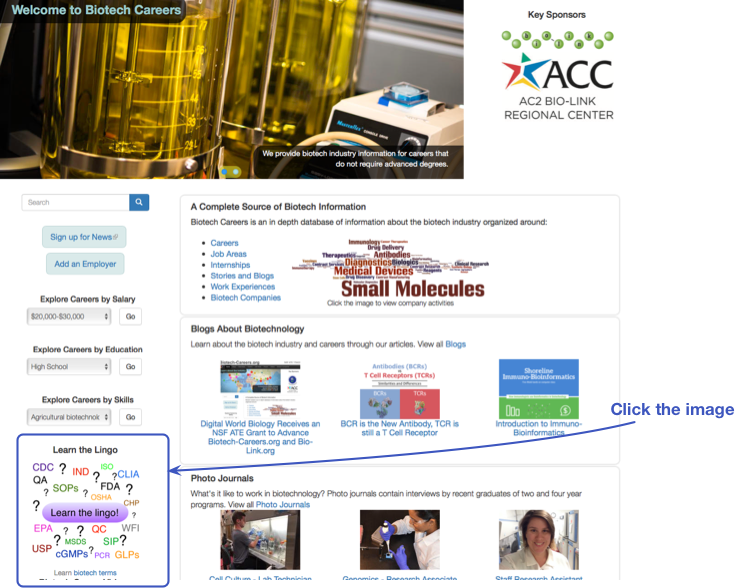 The second way to learn about a job area is to click a Job Area link in the right hand side menu. In this menu the size and color of a Job Area indicates the number of careers that are associated with it. Job Area pages link to related job areas, and, if content has been tagged with the job area it will be shown on the page too. We have videos that present different careers and photo journals from former students describing what it's like to work in different areas of biotech. Select the links to People or Videos to view these types of content. We're really interested in what will make the site work best for you. Please send us your feedback! And share the site with your friends and instructors.